Going to theme parks as often as I do it is inevitable that I’ll experience ‘near misses’, when the park in question is building a ride in the near future that you don’t get to go on, and since you’ve just been it’s unlikely you’ll be going back soon. Sometimes the new ride is so tantalising that I’ll prioritise revisiting the park even above visiting new ones. Such was the case with PortAventura. 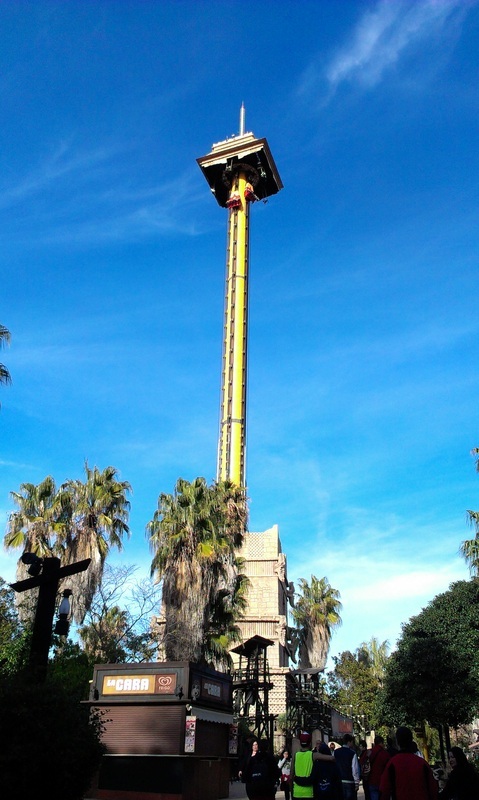 I first visited Catalonia’s biggest tourist resort in summer 2010 for a week; we stayed in the main PortAventura Hotel and the park quickly became my very favourite. But in 2012 they debuted Europe’s tallest roller coaster, Shambhala, which opened to rave reviews, and so I knew I had to get back there. It was a 4am start for Gatwick, and everything in the UK ran very smoothly. Once in Barcelona I had booked a shuttle coach with a company called Plana Bus which goes to Tarragona, Salou and PortAventura multiple times a day. The woman was very surly, despite my prebooking, and at almost every stop she insisted on checking my ticket again. Eventually when we got to Salou, and virtually everyone else had left, I was told that she wouldn’t be going to PortAventura, but instead I would have to catch another bus. Considering I paid €30 I was pretty irritated, especially since this cut a good half hour off of my park time. But get there I did, and soon I was inside the park. What I didn’t realise is that 6th January is Epiphany, or EL Dia de los Reyes, and is virtually as big as Christmas, and so from initially thinking the park would be quiet it now seemed like it could be packed. I tried to get an express pass, but fortunately I was told that the park was in fact completely empty, so I wouldn’t need one. The first thing you notice as you look across the lake is Shambhala; I think this is the very best view you can get, the lift hill and main drop are at a slight angle, making them look even higher, and the second hill is straight on, its massive parabolic curve enticing you like an entrance arch. But the first ride of the day was the closest: Furius Baco. When I visited in 2010 Baco rarely had a queue of less than 90 minutes, so to walk straight into the station was a blessing, although the atmosphere is certainly better when it’s crowded. Baco has a very odd theme but it’s excellently executed; it’s based around a vineyard owned by a crazy inventor. He’s designed a contraption (the coaster train) to collect the grapes for him, but his monkey assistant throws a literal spanner in the works and the train goes shooting off into the vineyard. The name is also nonsense: Furius is obviously misspelt in English, but it doesn't mean anything at all in Spanish, and Baco is word that vaguely refers to wine quality. It’s a launched coaster from Intamin; it accelerates the train to 84mph in just 3.5 seconds, making it one of Europe’s fastest, but bizarrely it never goes beyond 50ft above the ground. This means that it maintains its speed, and is therefore very violent. On top of this it uses ‘Wing Walker’ train; where the seats are on the side of the track, and these amplify the vibrations greatly if you’re on the outer seat. Many people hate the ride because it’s just too painful, but I loved it back in 2010. My opinion hasn’t changed; the launch is excellent, there’s a beautiful pop of airtime as you drop into the ravine, and the ride finishes with a quick inline twist. It is aggressive, it is a little painful, but it’s a massive rush. The one ride I didn’t manage to do on my last visit was Tami Tami, a small Vekoma coaster, because they were constructing a new Sesame Street land around it. As I headed round to the China area of the park I took a quick detour to get on it, and to have a look at the new area. Sesamo Aventura is wonderfully done, and fills the one gap in their roster that PortAventura was previously missing. It was actually the busiest area of the park, and it also provides stunning views of Dragon Khan and Shambhala. The time was coming for the main event of the day, and I headed down the winding paths of Polynesia into China. Dragon Khan was once the icon of PortAventura; a massive, twisted B&M Megalooper that sits at the back of the park. It’s now dwarfed by Shambhala, which sits right on top of it, but this hasn’t detracted from its quality. B&M rides are often scolded these days for being forceless, but Dragon Khan certainly does not fit that mould. It’s brutally forceful, but completely smooth, and all of its eight inversions are paced perfectly. The one thing that I felt it lacked before was a powerful drop, despite it being 161ft it never felt particularly forceful. However this time, right at the back of the train, I really felt it, and it completes the ride. B&M’s Hyper Coaster model has been hugely successful; despite Hyper Coasters theoretically being over 200ft tall they’ve built a large range of sizes since their debut in 1999; from the small(ish) 144ft Hollywood Dream in Universal Japan to the 306ft Gigacoaster Leviathan. When Shambhala was announced it was the very tallest B&M ride, and although this has since been surpassed by Leviathan (Canada’s Wonderland) it’s still the tallest overall coaster in Europe, regardless of manufacturer, at a mighty 249ft. The ride has a subtitle – Expedicion al Himalaya – and that’s exactly what it is: a journey to the mythical Himalayan kingdom of Shambhala. The area beneath the attraction is beautifully themed, there’s a large array of artefacts including a huge, partially submerged Buddha head. The ride station feels a little sparse; there’s no obvious continuation of the theme, but it really doesn’t matter. I sat in my extremely comfy seat with just a clamshell-style lapbar and was soon heading up the colossal lift hill. Every seat gives an excellent view because of the tiered train layout, and because the train is so exposed, and I started with the back; my usual favourite place. I was wrenched over the drop and into a tiny tunnel, and although it wasn’t quite as powerful as I imagined it’s still very forceful at the bottom. Then comes the large parabolic hill, which the train floats over gracefully. Next is a peculiar element that has been dubbed an Ampersand (that’s the name for this: &), it’s a gorgeously twisted turnaround. The back half of the ride consists of multiple airtime hills, including one which drops into a simulated splashdown; water jets squirt up beside the train. The restraints are downright terrifying, you are held in loosely by your legs; it really does feel like you could slip out. Next up was the front, and it is without a doubt the best seat on the train. I usually don’t particularly like the front because you don’t feel enough of the drop as the back of the train is still on the lift chain, but since Shambhala’s drop is so huge it makes no difference. In fact the hangtime you get is insane. You fly over the parabolic hill rather than float, and it provides a healthy dose of negative g force. In fact at the front the airtime on all of the hills, especially the tiny speed hill, is excellent, and at the very top of the Ampersand you’re so heavily banked that you fall into the side of your seat. Right now Shambhala is the most highly acclaimed B&M ride; it ranked 6th in Mitch Hawker’s Steel Internet Poll last year, although new rides do often rank higher. Of all the rides I’ve been on I’d rank it second, behind Walibi Holland’s Goliath. It’s unbelievably exhilarating, gloriously smooth, provides a great range of forces, is beautifully themed and has one of the best drops I’ve ever done. The airtime isn’t intense, which is why it doesn’t quite match up to Goliath, but it is plentiful, and it’s most certainly the best ride in a very, very good park. Despite Shambhala’s ridiculous size it’s not actually the tallest ride in the park, that accolade goes to Hurakan Condor, the 330ft Intamin Drop Tower. It’s one of largest, and best, of its kind in the world and it has five sides: two regular sit down, two stand up and one floorless stand up (effectively a bike seat). I ended up in the floorless stand up, which can be a little uncomfortable, but is probably the scariest. The five carriages are sent up and down at different times, and so during our already terrifying ascent each of the adjacent carriages screamed past us in the opposite direction. There’s little time to enjoy the view, everything’s so tiny from up there anyway, before you’re hurled ground wards. It’s a breathtaking drop, and of course it lasts for ages. The final coaster was Stampida, a duelling wooden coaster from now-defunct American company CCI. Like Furius Baco, Stampida is much maligned for its poor ride quality, but also just like Baco I really rather enjoyed it three years ago. The ride was no doubt violent, but it delivered a lot of airtime and was just plain fun. However, things have changed. The ride now has zero airtime, it’s even rougher, and it shuffles around the track as if all the cars are connected by springs. It’s a really nasty ride now and, having initially planned a number of re-rides, I left it as soon as possible. That was the last ride of the day and I finished off with some surprisingly good food in a saloon style restaurant. PortAventura has a large range of unique fast food/sit down restaurant hybrids which serve good, fast and (reasonably) healthy food; it’s a breath of fresh air from the usual fast food brands most parks offer. I opted for the train back rather than the bus; PortAventura has its own, albeit tiny, station just past the El Paso hotel. The trip to Barcelona Sants is about 80 minutes and only costs €8, so that’s definitely the way to do the trip if you fly to Barcelona Airport. I strongly recommend NOT doing PortAventura in a single day. First of all it is a tremendous hassle to get there from London, but more crucially you need far longer to properly explore every corner of the park. There are so many shows, water rides and hidden attractions that you’ll miss on the first few circuits. In January, and on the very last day of the season, the park was completely dead, most of the water rides weren’t running, and of course I’d been before for a whole week so just three hours was plenty, but if you’ve never been it’s so worth it to invest more time.